Stock status is current as of 4/25/2019 10:10 PMET. Say hello to the Snowflake, the first professional portable USB microphone. Whether you're recording your newest podcast, talking business on the web, or just narrating your latest great family movie, the Snowflake can capture it with amazing clarity and depth that's head and shoulders above any comparable portable USB on the market! The Snowflake works on both Mac and PC with no complicated drivers to install: just connect it to your computer's USB port, follow the prompts and you'll have high-fidelity sound in no time. 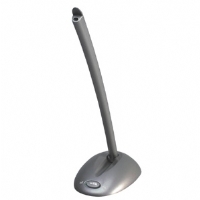 It's perfect for podcasting, voice recognition software, iChat, and VoIP software such as Skype and Vonage. Or use it for dictation, field recording, lecture recording, and narration for slideshows and PowerPoint presentations. The sky's the limit. It's even great for recording music via GarageBand and other multitrack recording software. Designed with the traveler in mind, the Snowflake's unique design allows you to place it on a desk or flat surface near your computer, or mount it to the screen of most laptops. 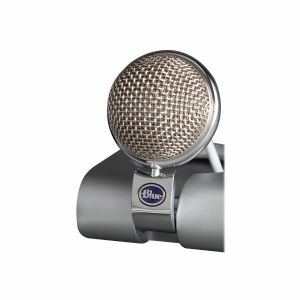 Because it simply connects to your USB port, it offers a wide range of applications coupled with an ease of use never before offered in a professional-quality microphone. 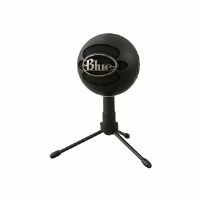 In the tradition of Blue's line of renowned studio microphones, the Snowflake features Blue's superior proprietary capsule and circuit design, optimized to make sure that you always get the best sound possible into your computer, and sets a new standard for digital recording on the go!